Ships of the Transocean Shipping Co. In Dåseberga harbour there is a chance to see one or more of the following ships along the quay. Some have already been presentated in the forums described and others will only be described in here. All are parts of the famous Dåseberga shipping company Transocean owned by the (in Dåseberga) well known Julius Bååth. The list of Transocean ships will be added to as the fleet grows or are enrolled to the shipping ccompany. 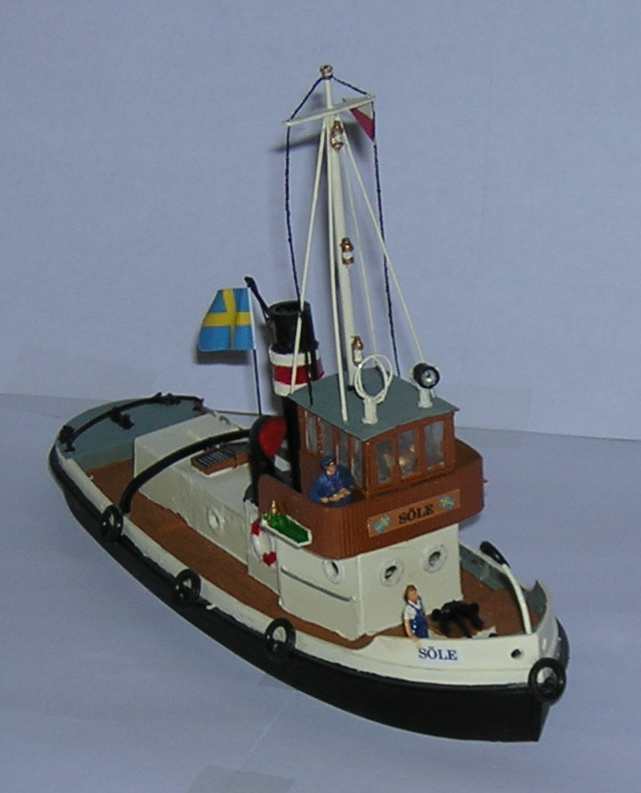 S/B Söle - A classic harbour tug. The model is based on the NOCH model 35710 and is really re-built. The only main part remaining is the hull and deck minus hatches from the kit. Everything else is scratch built. A successful conversion to give an impression of a mid size tug from the 1950's. Commander is Captain Styrbjörn Pullman, an experienced skipper that have chosen tug service after a long time on the seven seas from young mate to captain. S/B John B Lundh - A slightly smaller tug made to look somewhat like the Storm Princess, one of the Stormking company´s tugs from the Gothenburg harour of the 1950's. The Storm tugs was the ones most often pulling the railroad wagon barges around the harbour for exchanging cargo directly between ship and wagon. The wagon barges were built for narrow gauge, something that was not found generally in the Gothnburg harbour, hence the barge solution. S/B John B Lundh was commanded by the very able but stubborn Captain Arne Ankare, almost as stubborn as the captain of S/B Söle. S/S Puff - Puff is a copy of an English puffer, a small coastal ship built to be supply ships for the Royal Navy. Her dimensions are such that she can also go through canals and locks which also are found in Sweden. A complete scratch build as first test build with, I think, a quite OK result. This type of ships in H0 scale does not exist over counter. Captain: von Krantz, as the name says, he has a nice and well trimmed classical skippers beard and in all other respects a sailor with style. 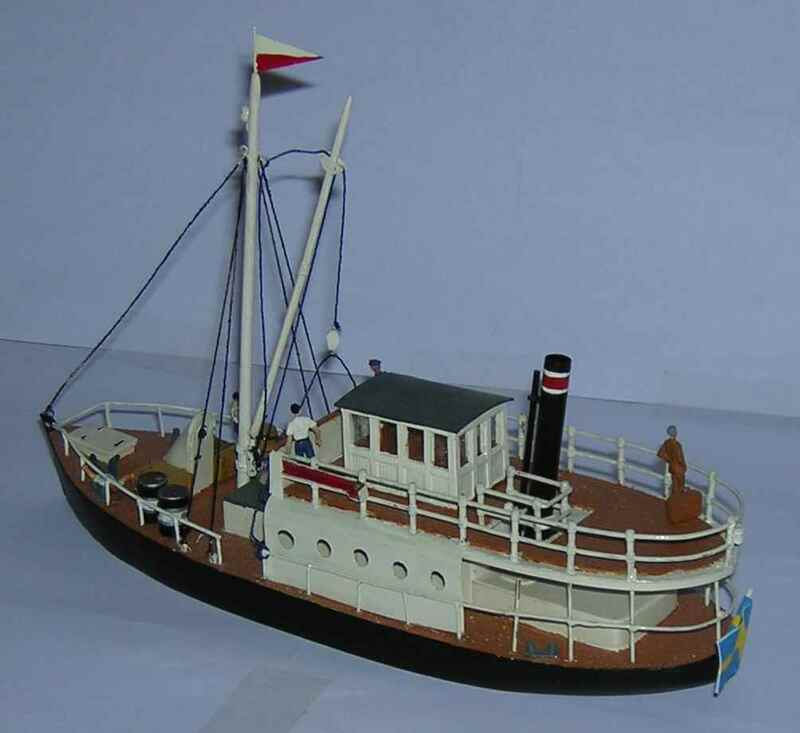 S/S Hwila II - A free modelling of a ship named S/S PIUS who sailed on some of Swedens canals. A 19th century ship surviving a long time and combining both passenger and cargo was a good ship in the right size. The model is built from wood, plastic, brass, sewing thread, etc. This type of ship is not possible to purchase over a counter. Railway Wagon Barge 101 - One of the SDJ wagon barges that made it possible to load and unload cargo directly between raillway wagons and ships without having narrow gauage track available at the quay. The concept is taken from the Gothenburg harbour where the VGJ company did this during the first half of the 20th century. The tracks were standard gauge on all quays apart from the Gullberg quay. Therefore VGJ built a barge dock at Gullberg in order to handle the wagons by sea. Every barge could take up to three wagons and were then towed into the harbour by tugs and tied alongside the ships for cargo exchange. Common tugs for this service were among others the Storm Princess mentioned above.